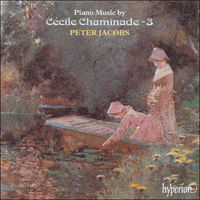 This third volume in Peter Jacobs's survey of the piano music of Cécile Chaminade contains at its heart her one Piano Sonata, a relatively early work dedicated to Moszkowski. Alongside come eight miniatures from the Album des Enfants, and a selection of the morceaux and salon pieces on which her reputation largely – if unjustly – rests. Cécile Louise Stéphanie Chaminade was born in Paris in 1857 and died in Monte Carlo in 1944. Although she came from a non-musical family she was something of a prodigy as a pianist and composer—she began writing sacred music at the age of eight. It was Bizet who advised Chaminade’s parents that she deserved a sound musical education: as she was unable to enter the Conservatoire (which did not then admit women) she studied privately with several teachers. These included Le Couppey (for piano) and Savard (for counterpoint, harmony and fugue); she also studied violin with the celebrated Belgian Martin Marsick, a pupil of Joachim, and composition with Benjamin Godard. Furthermore, she attained proficiency as a conductor, made her concert debut at the age of eighteen, toured widely, and became a well-known public figure, eventually receiving the Légion d’Honneur from the French government. In the course of her long life Chaminade produced around 350 works including a comic opera, a ballet, a choral symphony entitled Les amazones, chamber and orchestral music, and about a hundred songs. But the area in which she excelled and was most productive was the short lyric piano piece, and many of these became very popular, bringing her considerable commercial success and fame in France, Britain and the USA. They fed a market of domestic and salon music-making which had little use for profundity or complexity of thought but responded to graceful melody, simple forms, clear textures and dextrous, gratefully written exploitation of the medium: music, with its ‘easy velocity’, often designed to sound harder to play than it really is. But with the increasing attention being focussed in recent years upon the distinct achievements of women composers, and with belated respect thus accruing to such signally gifted figures as Fanny Mendelssohn, Clara Schumann, Lili Boulanger, Rebecca Clarke and Ruth Crawford, the reputation of Chaminade almost certainly calls out for upward revision. After all, as Norman Demuth perceptively remarks in his study of French piano music—which, if he cannot quite bring himself to intrude her into his main narrative, at least gives Chaminade a little ‘interlude’ chapter to herself—she was ‘nearly a genius in that she knew exactly what, and how, to write for pianists of moderate ability … we wish every writer for the piano had her innate gifts and could be equally musicianly in their own ways’. Demuth also stresses the fact that Chaminade’s music gracefully complements that of Fauré: while she may lack (or scruple to attempt) the latter’s innate profundity, she often matches him in elegance, melodic beauty and lyrical cantabile. It is hardly a criticism that she is usually easier to play. Chaminade’s Prélude in D minor, last of a set of three Préludes, Op 84, is a brilliant, incisive piece. It rapidly spans the keyboard with waves of energetic fast triplet figuration out of which emerges a surging, passionate tune. Sonorous harped chords characterize the more songfully expressive poco moderato middle section in the tonic major. The return to the opening key and material is poetically handled, the fast triplets eddying back in mysterious pianissimo. The harped chords reappear, now in the minor, just before the end. Rigaudon, No 6 of Chaminade’s Pièces romantiques, is termed a ‘Réduction pour piano seul’, presumably from an orchestral original. This is a gentle, courtly piece in the manner, perhaps, of Chabrier’s Pièces pittoresques. The main idea is minuet-like, but there is no well-defined trio, rather a subtle play of light and shade as the music gravitates between major and minor modes. By contrast, Les sylvains (‘The fauns’) is clearly structured around two sharply differentiated ideas and textures—the first gravely lyrical, with a gently pulsating accompaniment, mainly in low registers, and the other playful, mostly in higher regions, suggestive both of flute music and capricious acrobatics. Are these two fauns, old and young, or simply two sides of essential faun nature? The mocking glitter of the closing bars shows which has the upper hand. Valse-ballet, also known as Chaminade’s Valse No 6, is a vivacious and whimsical piece in C major, very clearly laid out in defined sections. The G major second strain mingles a cheerful fanfare with the main tune; a more thoughtful, rather Chopinesque idea in A minor occupies the middle section, and the fanfare returns in E before the Valse’s opening music is reprised. Very different—in its syncopations and little rhythmic and motivic awkwardnesses—is Inquiétude (‘Anxiety’), the third of Chaminade’s Pièces humoristiques. The fluttering pulse of the outer sections gives way to a central episode of heavy staccato chords, quite low in the register, perhaps to be understood as pounding heartbeats. Chaminade dedicated this piece to Rudolph Ganz, the (Swiss-born) American pianist and conductor who championed French music in America. Arabesque is an even more intricate piece. Its dance-measure is essentially decorative, but there are occasional hints of drama, and it builds to a powerful and unexpectedly virtuosic ending. Deft miniaturist as she was, Chaminade was never merely a purveyor of morceaux; however her only Piano Sonata is, like most of her larger-scale works, a comparatively early production, from the period when she had to make her mark in the sophisticated musical milieu of Paris. Dedicated to Moritz Moszkowski, the Sonata’s C minor tonality, and the Allegro appassionato marking of its first movement, make clear from the outset that in her enterprise Chaminade was evoking the protection of Beethoven, evident also in the opening theme which rises in powerful waves in the left hand. But a contrasting tranquillo idea is a complete surprise: it seems to unfold in a single line which soon reveals itself as the first voice in a neo-Bachian fugal invention. After combination with the first theme it leads to a vaunting, heroic figure and some robustly Brahmsian writing before the initial theme returns in the left hand and initiates a vigorous codetta. Rather than try to reconcile these rather conflicting influences Chaminade opts for drastic compression. The development, beginning with a chordal version of the fugal theme, is very short, and the recapitulation is truncated; the fugal theme is represented only by its opening phrase, the movement passing swiftly to a con fuoco conclusion. The Andante slow movement, in A flat, begins as a beautifully melodious romantic reverie, disturbed by a fateful figure in dotted rhythm that relates to the first movement’s opening theme. The movement veers to C sharp minor for its songful second theme before building to a rhapsodic climax that combines all the ideas so far heard. The romantic melody of the opening returns, but the coda melts exquisitely away on the second theme. The virile, spirited finale is a kind of toccata, its near-perpetual motion of semiquavers, broken by sforzato left-hand jabs, reminiscent perhaps of Schumann. This motion becomes the background to a long-spanned contrasting theme, but again the composer opts for a structure more abbreviated than her premises might well support: writing of increasing bravura leads to a shortened reprise of the opening semiquaver idea, and a brusque final cadence. In contrast to this (at least by intention) ambitious work is a selection of numbers from Chaminade’s mature collection of children’s pieces, the Album des enfants, published in two parts in 1906 and 1907. She does not write ‘down’ to younger performers; though short, and texturally and technically simpler than most of her other music, these pieces are not ‘childish’ or overtly concerned with childhood themes. The lulling melody of the C major Idylle has a bright, classical clarity, while the A minor Gavotte is one of her occasional homages to the world of the Baroque clavecinistes, with its evocation of harpsichord style and more assertive middle section. The cheeky Rondeau in F could almost be a popular music-hall song; by contrast the faintly Arabic melody of the E minor Orientale weaves an appropriately hypnotic spell, open fifths in the bass suggesting an exotic drone. The charming E major Aubade gives way to a Patrouille in G minor, a miniature whose sombre suggestions of military march and fanfare acquire a running quaver accompaniment in the left hand to intensify the effect of purposeful motion. The most elaborate of these children’s pieces, with a full repeat of its second section, is the A major Villanelle, a delightfully mock-classical invention evoking, perhaps, the world of Watteau and the fêtes galantes. This selection concludes with the scintillating little Tarantelle in A minor, whose excitable, irrepressible motion demands bravura execution whatever the performer’s age. The remaining four pieces in this programme show Chaminade in full concert rather than salon mode. Le passé (‘The past’) is the third of her Poèmes provençales, a darkly lyrical and emotional utterance in D flat. Almost entirely concerned with its melancholic opening subject, it has no real middle section—ethereal dolcissimo chords, almost like a chorale, seem to promise one, but lead instead to an appassionato reprise of the main idea. The piece deliquesces in a mood of sweet regret. Sérénade espagnole was originally published in 1895 as a song under the title Chanson espagnole. It rapidly became one of Chaminade’s most popular works in that genre, and was issued in a number of arrangements by other hands (Fritz Kreisler, no less, arranged it for piano trio in 1903); Chaminade’s own solo piano version appeared in 1926. Its hints of local colour, haunting tune, and ‘Spanish’ rhythms immediately reveal the reasons for the piece’s success. The Quatrième valse, in D flat, is a good example of Chaminade’s mastery of this particular dance genre. After a swaggering opening the blithe and attractive main tune dominates the proceedings, sometimes enveloped in trills and ornamentation. The middle section, whose subject is rather more serious and ardent, is in B minor. The modulatory passage that then leads back to the main waltz tune is subtly expressive, and the coda is Chaminade at her most flamboyant. Flamboyant, too, is the Cortège in A major, subtitled ‘Fragment’. Every so often Chaminade produces a work which bursts the bounds of the decorum that informs most of her music, and this is one such. The swaggering bravado of this military march almost recalls the satirical heroics of Alkan’s Capriccio alla soldatesca, and when the music turns to the minor she produces another surprise by turning the march tune into a fugue subject. An extended development centred around E major allows a cadence back to the opening material, with a thunderous left-hand drum figure marked ‘Timbales’ (was this, in truth, a sketch for an orchestral piece?) just before the closing bars. Cécile Louise Stéphanie Chaminade naquit à Paris en 1857 et mourut à Monte Carlo en 1944. Pendant sa longue vie, Chaminade produisit environ 350 ouvrages, dont un opéra-comique, un ballet, une symphonie chorale Les amazones, de la musique de chambre et d’orchestre et environ une centaine de chansons. Mais c’est dans le domaine du court morceau de musique lyrique pour piano qu’elle excellait et pour lequel elle composa le plus d’ouvrages dont plusieurs devinrent très populaires. Elle leur dût un considérable succès commercial et une grande renommée en France, en Grande-Bretagne et aux Etats-Unis. Ces morceaux alimentaient un marché pour musiciens de salon ou ceux qui simplement jouaient en famille et qui ne voulaient ni profondeur ni complexit de pensée mais répondaient à une gracieuse mélodie, de simples formes, de nettes textures et une exploitation adroite et sincère du genre; une musique qui, avec sa «vélocité facile», était souvent conçue pour paraître plus difficile qu’elle ne l’était en réalité. Le Prélude en ré mineur de Chaminade, dernier des Trois préludes, op. 84, est une pièce brillante et incisive, qui couvre rapidement le clavier avec des vagues de figurations de triolets prestes et énergiques, d’où émerge une mélodie déferlante, passionnée. Des accords harpés sonores caractérisent la section centrale poco moderato, plus mélodieusement expressive, dans le mode majeur tonique. Le retour à la tonalité et au matériau initiaux est poétiquement mené, les triolets rapides tourbillonnant dans un mystérieux pianissimo. Les accords harpés reparaissent, désormais en mineur, juste avant la fin. Rigaudon, la sixième des Pièces romantiques de Chaminade, est dénommée «Réduction pour piano seul», probablement d’un original pour orchestre. Il s’agit d’une pièce douce et courtoise, peut-être à la manière des Pièces pittoresques de Chabrier. Le thème principal est de type menuet, mais il n’y a pas de trio bien défini, plutôt un subtil jeu de lumières et d’ombres établi à mesure que la musique gravite entre les modes majeur et mineur. A contrario, Les sylvains est une pièce clairement structurée autour de deux ensembles de thèmes et de textures nettement différenciés—l’un, gravement lyrique, avec un accompagnement doucement palpitant, se tient le plus souvent dans les registres graves tandis que l’autre, enjoué, surtout dans les sphères supérieures, évoque à la fois une musique pour flûte et des acrobaties capricieuses. Sont-ce deux faunes, un vieux et un jeune, ou simplement deux aspects de l’essence de la nature faunesque? Le scintillement moqueur des mesures conclusives montre qui a le dessus. La Valse-ballet, également connue comme la Valse no 6 de Chaminade, est une pièce vivace et fantasque en ut majeur, très clairement construite en sections définies. La seconde subdivision en sol majeur mêle une fanfare joyeuse à la mélodie principale; un thème plus réfléchi en la mineur, plutôt chopinesque, occupe la section centrale, puis la fanfare revient en mi avant la reprise de la musique d’ouverture de la Valse. Inquiétude, la troisième des Pièces humoristiques de Chaminade, est très différente de par ses conte-temps, mais aussi de par ses petites gaucheries rythmiques et motiviques. Le rythme irrégulier des sections extrêmes cède la place à un épisode cental de lourds accords staccato, très graves, qui sont peut-être à comprendre comme de forts battements de cœur. Chaminade dédia cette pièce au pianiste et chef d’orchestre américain (d’origine suisse) Rudolph Ganz, qui défendit la musique française en Amérique. Arabesque est une pièce encore plus complexe. Sa mesure de danse est essentiellement décorative, ce qui n’exclut pas d’occasionnelles touches théâtrales, et elle se construit jusqu’à une fin puissante, d’une virtuosité inattendue. Habile miniaturiste, Chaminade ne fut jamais une simple pourvoyeuse de morceaux. Sa seule Sonate pour piano—dédiée à Moritz Moszkowski—est, comme la plupart de ses œuvres à plus grande échelle, une production relativement ancienne, datant de la période où elle dut s’imposer dans le milieu musical parisien sophistiqué. La tonalité en ut majeur de cette Sonate et l’Allegro appassionato caractéristique de son premier mouvement montrent d’emblée que Chaminade invoquait la protection de Beethoven, également manifeste dans le thème initial qui s’élève en de puissantes vagues jouées avec la main gauche. Mais un thème contrastant, tranquillo, est une surprise totale: il semble se déployer dans une seule ligne, qui se révèle bientôt comme la première voix d’une invention fuguée néo-bachienne. Passé une combinaison avec le premier thème, il conduit à une figure hâbleuse, héroïque, et à quelque écriture robustement brahmsienne, avant que le thème initial revienne dans la main gauche et amorce une vigoureuse codetta. À une tentative de réconciliation de ces tendances plutôt conflictuelles, Chaminade préfère une compression drastique. Le développement, qui débute avec une version en accords du thème fugué, est très court, tandis que la reprise est tronquée; le thème fugué n’est représenté que par sa phrase initiale, le mouvement passant rapidement à une conclusion con fuoco. Le mouvement lent Andante, en la bémol, débute comme une reverie romantique merveilleusement mélodieuse, toublée par une figure fatidique en rythme pointé, affiliée au thème initial du premier mouvement. Le mouvement vire au do dièse mineur pour son second thème chantant avant d’atteindre à un point culminant rhapsodique, combinaison de tous les thèmes entendus jusqu’alors. La mélodie romantique de l’ouverture revient mais la coda s’évanouit exquisément au second thème. Le finale, viril et fougueux, est une sorte de toccata, au mouvement presque perpétuel de doubles croches, brisé par des coups sforzato joués avec la main gauche—peut-être une rémiscence de Schumann. Ce mouvement devient la toile de fond d’un ample thème contrastant, mais le compositeur opte à nouveau pour une stucture plus abrégée que ce que ses prémisses pourraient supporter: une écriture d’une bravoure croissante conduit à une reprise accourcie du thème initial de doubles croches et à une brusque cadence finale. La sélection d’un certain nombre de pièces enfantines abouties, extraites de l’Album des enfants publié en deux parties (1906 et 1907), contraste avec l’ambition (au moins dans l’intention) de l’œuvre précédente. Chaminade n’«écrit» pas pour des interprètes plus jeunes: bien que brèves, d’une texture et d’une technique plus simples que dans la majeure partie de ses autres musiques, ces pièces ne sont ni «puériles», ni ouvertement consacrées à des thèmes de l’enfance. La mélodie berçante d’Idylle, en ut majeur, recèle ainsi une clarté brillante, classique, tandis que la Gavotte en la mineur est un de ces hommages occasionnels du compositeur au monde des clavecinistes baroques, avec son évocation du style du clavecin et sa section centrale plus assurée. L’effronté Rondeau en fa pourrait presque être une chanson populaire de music-hall; a contrario, la mélodie légèrement arabe d’Orientale, en ré mineur, tisse un charme pertinemment hypnotique, les quintes à vide dans la basse suggérant un bourdonnement exotique. La charmante Aubade en mi majeur cède la place à une Patrouille en sol mineur, miniature dont les sombres évocations de marche militaire et de fanfare acquièrent un accompagnement continu de croches dans la main gauche pour intensifier l’effet de mouvement résolu. La plus élaborée de ces pièces enfantines, avec une répétition complète de sa seconde section, est la Villanelle en la majeur, invention délicieusement simili-classique qui évoque peut-être l’univers de Watteau et les fêtes galantes. Cette sélection s’achève sur la scintillante petite Tarantelle en la mineur, dont le mouvement nerveux, irrépressible, requiert une exécution toute de bravoure, quel que soit l’age de l’interprète. Les quatre dernières pièces de ce programme montrent Chaminade dans un style de grand concert plutôt que de salon. Le passé, le troisième de ses Poèmes provençales, est une déclaration sombrement lyrique et émotionnelle en ré bémol. Presque exclusivement occupée par son sujet initial, mélancolique, elle ne recèle pas de véritable section centrale—des accords éthérés dolcissimo, presque comme un choral, semblent en promettre une, mais conduisent en fait à une reprise appassionato du thème principal. La pièce se délite finalement dans un mode de doux regret. Originellement publiée en 1895 sous le titre Chanson espagnole, Sérénade espagnole devint rapidement une des chansons les plus populaires de Chaminade et fut publiée dans un certain nombre d’arrangements dus à d’autres musiciens (Fritz Kreisler, rien de moins, l’arrangea pour trio avec piano, en 1903); la version de Chaminade elle-même pour piano seul parut en 1926. Ses touches de couleur locale, de mélodie obsédante et de rythmes «espagnols» révèlent immédiatement les raisons de son succès. La Quatrième valse, en ré bémol, est un exemple de la maîtrise de Chaminade dans ce genre particulier de danse. Après une ouverture hâbleuse, la mélodie principale, joyeuse et attrayante, domine l’œuvre, parfois enveloppée de trilles et d’ornementations. La section centale, dont le sujet tend à étre plus sérieux et ardent, est en si mineur. Vient ensuite un passage modulant, subtilement expressif, qui reconduit au thème principal de la valse, tandis que la coda nous dévoile Chaminade dans ce qu’elle a de plus flamboyant. Autre morceau flamboyant, le Cortège en la majeur est sous-titré «Fragment». De temps à autre, Chaminade produit une œuvre qui fait voler en éclats les limites du décorum qui façonne l’essentiel de sa musique. Ainsi en est-il de Cortège, marche militaire dont la bravade fanfaronne rappelle l’emphase satirique du Capriccio alla soldatesca d’Alkan. Et lorsque la musique vire au mode mineur, Chaminade provoque une nouvelle surprise en transformant la mélodie de la marche en sujet de fugue. Un développement prolongé, centré autour du mi majeur, autorise une cadence qui revient au matériau initial avec, juste avant les mesures finales, une retentissante figure de tambour dans la main gauche, marquée «Timbales» (s’agissait-il, en vérité, de l’esquisse d’une pièce pour orchestre?). Cécile Louise Stéphanie Chaminade wurde 1857 in Paris geboren und starb 1944 in Monte Carlo. Im Verlauf ihres langen Lebens schuf Chaminade rund 350 Werke, darunter eine komische Oper, ein Ballett, eine Chorsinfonie mit dem Titel Les amazones, Orchester- und Kammermusik sowie ungefähr hundert Lieder. Doch das Gebiet, auf dem sie sich besonders auszeichnete und am produktivsten war, ist das kurze lyrische Klavierstück. Von diesen waren viele äußerst populär und trugen ihr erheblichen kommerziellen Erfolg in Frankreich, Großbritannien und den USA ein. Sie bediente den Markt für häusliches Musizieren und Salonmusik, der für Tiefgründigkeit oder gedankliche Komplexität nichts übrig hatte, aber elegante Melodik, schlichte Formen, klare Strukturen und gekonnte, dankbare Umsetzung des Mediums zu schätzen wußte: Musik, die dank ihrer mühelosen Geläufigkeit häufig darauf angelegt war, schwieriger zu klingen, als sie in Wahrheit ist. Chaminades Prélude in d-Moll, das letzte der drei Präludien des op. 84, ist ein brillantes und prägnantes Werk. Es umspannt in schnellen Wogen schwungvoller Triolen-Figuren die gesamte Tastatur; aus den Triolen steigt dann eine drängende, leidenschaftliche Melodie empor. Klangvolle Akkorde der Harfe charakterisieren den eher singenden, ausdrucksvollen mittleren Abschnitt, poco moderato, auf dem Dur-Tonika-Grundton. Die Wiederaufnahme der anfänglichen Tonart und des einleitenden Materials wird voller Poesie gestaltet, und die schnellen Triolen wirbeln in mysteriösem pianissimo abermals hervor. Kurz vor dem Schluß erscheinen dann wiederum die Akkorde der Harfe, nun jedoch in Moll. Rigaudon, die Nr. 6 der Pièces romantiques von Chaminade, wird als eine „Verkürzung für Klaviersolo“ bezeichnet und stammt vermutlich ursprünglich aus einem orchestralen Werk. Dies ist ein sanftes, vornehmes Stück, das eher im Stile von Chabriers Pièces pittoresques gehalten ist. Die Hauptidee ähnelt einem Menuett, obwohl ein eindeutiger Trioabschnitt fehlt, und in den würdevollen Wechseln zwischen Dur- und Molltonarten entsteht vielmehr ein Spiel aus Licht und Schatten. Einen völligen Kontrast hierzu bildet Les sylvains („Die Faune“), ein Stück, das unverkennbar um zwei scharf voneinander abgegrenzte Ideen und Strukturen gegliedert ist—eine äußerst lyrische, hauptsächlich in den tieferen Tonlagen gehaltene Idee mit sanft pulsierender Begleitung und eine spielerische, größtenteils in den höheren Lagen gehaltene Idee, die sowohl Flötenmusik als auch kapriziöse Akrobatik andeutet. Sind dies zwei Faune, der eine alt, der andere jung, oder ganz einfach zwei Seiten des Faunenwesens? Das spöttische Funkeln der abschließenden Takte zeigt schließlich, wer die Oberhand hat. Valse-ballet ist auch als Chaminades Valse Nr. 6 bekannt und ein lebhaftes, neckisches Stück in C-Dur, dessen Abschnitte deutlich von einander abgegrenzt dargelegt werden. Im zweiten Thema in G-Dur mischt sich eine fröhliche Fanfare mit der Hauptmelodie; eine recht nachdenkliche, eher chopinähnliche Idee in a-Moll ist im mittleren Abschnitt vorherrschend, während die Fanfare vor der Reprise des eröffnenden Walzermaterials abermals in E erschallt. Sehr anders ist das dritte von Chaminades Pièces humoristiques, Inquiétude („Sorge“) aufgrund seiner Synkopierungen und einer gewissen rhythmischen und motivischen Unbeholfenheit. Der flatternde Rhythmus der äußeren Abschnitte weicht einem zentralen Zwischenspiel, das vermutlich ein pochendes Herzklopfen darstellen soll und in schweren Staccato-Akkorden im tiefen Register erklingt. Chaminade widmete dieses Stück Rudolph Ganz, dem in der Schweiz geborenen amerikanischen Pianisten und Dirigenten, der sich in Amerika sehr für die Verbreitung französischer Musik einsetzte. Arabesque ist ein noch anspruchsvolleres Stück. Der Tanzrhythmus ist im wesentlichen dekorativ und hat zuweilen den Hauch eines Dramas. Das volle Werk steigert sich zu einem ausdrucksvollen und unerwartet virtuosen Abschluß. Als geschickte Meisterin der Komposition von Miniaturen verfaßte Chaminade kaum je Morceaux-Werke; allerdings ist ihre Klaviersonate wie die meisten ihrer größeren Stücke ein verhältnismäßig frühes Werk. Die Sonate stammt aus einer Zeit, in der die Komponistin ihre Position in der anspruchsvollen Pariser Musikwelt auf markante Weise zu festigen suchte und ist Moritz Moszkowski gewidmet. Sowohl die Tonalität der Sonate in c-Moll als auch die Markierung Allegro appassionato des ersten Satzes lassen von Anfang an keinen Zweifel daran, daß Chaminade in ihrem Schaffen einen Hauch von Beethoven heraufbeschwörte, ein Aspekt, der auch im einleitenden Thema deutlich ist, das in von der linken Hand gespielten kraftvollen Wogen emporsteigt. Allerdings wirkt eine kontrastierende Idee tranquillo völlig überraschend: Sie scheint sich geradlinig aus einer einzigen Zeile heraus zu entfalten, die sich schon bald als die erste Stimme einer fugalen Invention in Neo-Bachscher Manier offenbart. Nach einer Kombination mit dem ersten Thema führt sie sowohl zu einer preisenden, heroischen Figur als auch zu Brahmsschem Stil, ehe die linke Hand abermals das anfängliche Thema wiederaufnimmt und eine ausdrucksvolle Codetta einleitet. Anstatt diese recht gegensätzlichen Einflüsse miteinander in Einklang zu bringen, gibt Chaminade einer drastischen Komprimierung den Vorzug. Die mit einer akkordischen Version des Fugenthemas beginnende Durchführung ist daher sehr kurz, und die Reprise gestutzt. Das Vorstellen des Fugenthemas beschränkt sich lediglich auf die eröffnende Phrase, während der Satz schließlich über ein con fuoco schnell abgeschlossen wird. Der langsame Andante-satz in As beginnt als eine wundervoll melodische und romantische Träumerei, die von einer verhängnisvollen, wiederum an das eröffnende Thema des ersten Satzes anknüpfenden Figur in punktiertem Rhythmus gestört wird. Mit der zweiten singenden Melodie wechselt der Satz nach cis-Moll über, ehe sich die Musik zu einem rhapsodischen Höhepunkt steigert, der alle bisher erklungenen Ideen vereint. Die romantische Idee der Einleitung erscheint abermals, allerdings löst sich die Coda während des zweiten Themas auf wunderbare Weise auf. Das männliche, energisch-geistvolle Finale ist als Toccata gestaltet, und das beinahe ständige, lediglich von Sforzato-Stößen der linken Hand unterbrochene Fortschreiten in Sechzehntelnoten mag an Schumann erinnern. Dieses Fortschreiten bildet den Hintergrund für ein umfangreiches, kontrastierendes Thema, aber die Komponistin wählt wiederum eine Struktur, die zu verkürzt ist, als daß sie ihr Werk tragen könnte: Das Komponieren eines Stückes in zunehmender Bravour-Manier führt in eine verkürzte Reprise der einleitenden Idee in Sechzehntelnoten über und endet in einer schroffen, abschließenden Kadenz. Im Gegensatz zu diesem (auf jeden Fall beabsichtigt) ambitiösen Werk stehen einige ausgewählte Werke aus Chaminades umfangreicher Sammlung von Kinderliedern, dem Album des enfants, das 1906 und 1907 in zwei Bänden veröffentlicht wurde. Sie „schreibt“ nicht auf jüngere Interpreten „herab“: denn selbst wenn diese Stücke kurz sind und von ihrer Struktur und Technik einfacher gestaltet als die meisten Werke ihrer anderen Musik, sind sie keinesfalls „kindlich“ oder sich ihres Genres als Kinderlieder offen bewußt. Die wiegende Melodie der Idylle in C-Dur ist von heller, klassischer Anschaulichkeit, während Gavotte in a-Moll den barocken Cembalostil der Clavécinisten heraufbeschwörend beinahe eine ihrer gelegentlichen Hommagen ist. Das munter-freche Rondeau in F hätte ein populäres Lied des Variété-Theaters sein können, ganz im Gegensatz zur leicht arabisch inspirierten Melodie in e-Moll in Orientale, die einen angemessen hypnotischen Zauber hervorruft, dessen offene Quinten der Baßstimme Klänge einer exotischen Bordunpfeife andeuten. Das bezaubernde Aubade in E-Dur weicht einer Patrouille in g-Moll, einer Miniatur, deren düstere Andeutungen eines Militärmarsches und einer Fanfare die Begleitung laufender Achtelnoten auf der linken Hand bedürfen, um die Wirkung des entschlossenen Fortschreitens noch zu untermauern. Das am kunstvollsten ausgearbeitete Stück dieser Auswahl an Kinderliedern ist Villanelle in A-Dur, das mit einer vollständigen Wiederholung seines zweiten Abschnittes eine wunderbar spöttisch-klassische Invention—vielleicht der Welt Watteaus oder der Fêtes galantes—zu entfesseln vermag. Die Auswahl schließt mit der faszinierenden kleinen Tarantelle in a-Moll ab, deren aufbrausendes, unbezähmbares Tempo jedem Interpreten, ob jung oder alt, einiges an Bravourtechnik abverlangt. Die letzten vier Stücke dieses Programms stellen eher Beispiele von Chaminades Orchesterstimmung als ihrer Salonmusik dar. Le passé („Die Vergangenheit“), das dritte ihrer Poèmes provençales, ist eine finster lyrische und gefühlvolle Aussage in Des. Es dreht sich nahezu ausschließlich um das eröffnende melancholische Thema und hat keinen eigentlichen mittleren Abschnitt—allerdings deuten ätherische dolcissimo-Akkorde einen solchen wie in einem Choral an, leiten statt dessen aber in eine appassionato Reprise der Hauptidee. Das Stück strahlt eine Stimmung süßen Bedauerns aus. Sérénade espagnole war ursprünglich 1895 als Lied mit dem Titel Chanson espagnole veröffentlicht worden. Es wurde schnell eines der beliebtesten seines Genres und erschien in zahlreichen Transkriptionen aus der Feder anderer Komponisten (kein geringerer als Fritz Kreisler erarbeitete 1903 eine Version für Klaviertrio); Chaminades eigene Solo-Klavierversion erschien 1926. Der Hauch räumlicher Klangfarben, die schwermütige Melodie und der „spanische“ Rhythmus offenbaren unmittelbar die Gründe für den Erfolg dieses Werkes. Der Valse Nr. 4 in Des ist ein gutes Beispiel für Chaminades Meisterung dieses besonderen Tanzgenres. Nach einer forschen Einleitung dominiert die muntere und ansprechende, zuweilen in Trillern und Verzierungen eingehüllte Hauptmelodie den weiteren Verlauf. Der mittlere Abschnitt, mit einem seriösen und leidenschaftlichen Thema, ist in h-Moll gehalten. Die subtil ausdrucksstarke Modulationspassage führt dann zur eigentlichen Walzermelodie zurück, und in der Coda zeigt Chaminade eine Extravaganz, wie sie besser nicht hätte sein können. Auch das mit dem Untertitel „Fragment“ versehene Cortège in A-Dur ist von einiger Extravaganz. Gelegentlich schuf Chaminade Werke, die jene Grenzen der Würde und des Anstandes überschritten, die den Löwenanteil ihrer Musik durchdringen, und dies ist ein solches Stück. Der forsche Wagemut dieses Militärmarsches erinnert beinahe an die satirischen Helden in Alkans Capriccio alla soldatesca, und indem die Musik in Moll überwechselt, kreiert die Komponistin eine weitere Überraschung, denn die Marschmelodie entfaltet sich nun zu einem Fugenthema. Eine erweiterte, um E-Dur geschlungene Durchführung führt in einer Kadenz zum einleitenden Material zurück, mit einer donnernden, mit „Timbales“ markierten Trommelfigur (war dies in Wirklichkeit nicht die Skizze für ein orchestrales Werk? ), die kurz vor den abschließenden Takten von der linken Hand gespielt wird.